With the Nuki Smart Lock 2.0, you’ll not only get the ability to connect your electronic door lock to Apple HomeKit, but will also benefit from another exciting feature – the Nuki Door sensor. What is the door sensor? 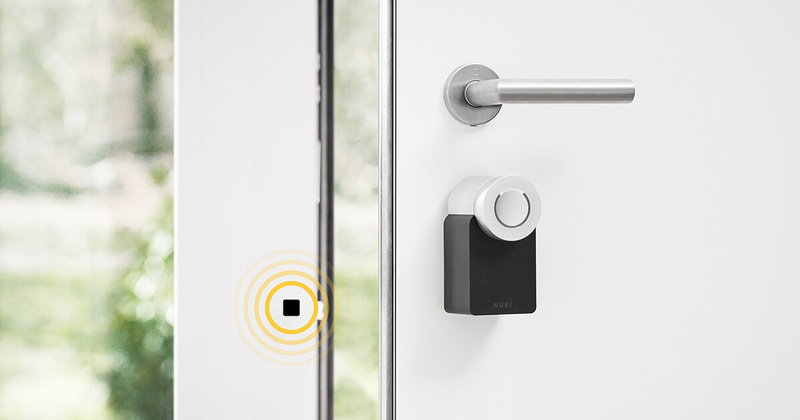 A magnetic sensor has been integrated into the Smart Lock 2.0. For this sensor to work, a magnet will need to be attached to the door frame – a small 15×15 mm magnet that comes with each Nuki Smart Lock 2.0. What are the advantages of the door sensor? Faster Auto Lock function – Nuki locks immediately as soon as you close your door. You’ll no longer have to wait the pre-determined time before locking. Notifications – you’ll receive a warning if you try to lock your front door while it is open. Quicker Lock ‘n’ Go function – locks your door automatically when you leave your home and the door sensor detects ‘closed’ status. How is the door sensor installed and setup? The door sensor is attached to the door frame on the inside of your front door. Make sure that the magnet is flush with the bottom edge of your Smart Lock. The setup (activation or calibration) is done via the Nuki App – just follow the instructions. You can also view the status of your door sensor via Nuki Web, just like in the Nuki app. The setup of the door sensor can only be done via the Nuki app since you’ll have to be within Bluetooth range of your Smart Lock 2.0. Does the door sensor have to be activated when using Smart Lock 2.0? No, you can use the Smart Lock 2.0 without the door sensor. However, it is a practical additional feature. If you wish, you can also have the door sensor status displayed in the log. You can deactivate the logging of the door sensor status at any time at the push of a button. The door sensor is currently marked as a ‘beta’ feature in the Nuki app, which you can use optionally. Why is the door sensor in ‘beta’ status? The new door sensor and the algorithms behind it are very complex. Therefore, we would like to gather feedback and experiences of our community. For this reason, the door sensor was released as a ‘beta’ feature when Smart Lock 2.0 was launched – this is noted accordingly in the Nuki app. Can the door sensor also be retrofitted to the 1st generation Smart Lock? No, it is not possible to retrofit the door sensor to your 1st generation Smart Lock – the new Smart Lock 2.0 has its own magnetic sensor. How is the door sensor status displayed in the Nuki app? In addition to the usual screens for “unlocked” and “locked”, the “door open” status is now also displayed with its own icon in the Nuki app. As soon as you have activated the door sensor for your Smart Lock 2.0, you will also see the door status (open, closed or door sensor malfunction). What technology does the door sensor use? The door sensor works with a magnetic sensor that detects and measures the magnetic field strength of the neodymium magnet. We chose a magnetic sensor because no other sensor technology reliably detected the “closed” status. The detection did not work reliably when using other sensors (such as motion or acceleration sensors). What was the biggest challenge during development? The biggest challenge during development was the development of an algorithm that takes into account the different magnetic field strengths and their disturbances. The algorithm was developed on the basis of a mathematical model built from measurement and simulation data. We hope you enjoy this cool feature of your Nuki Smart Locks 2.0!